“I thought sourdough bread wasn't supposed to mold that fast!” is a common email we receive. 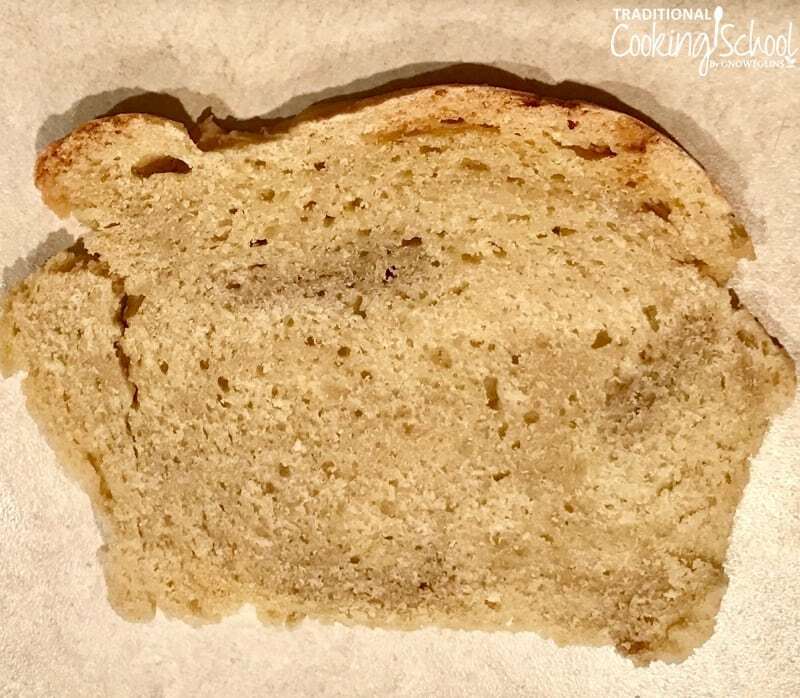 Recently, Julie P. sent an image and info about her sourdough bread woes… including what she thinks is mold at 3 days. She too is wondering if her sourdough bread should have molded that quickly. And, she's asking for guidance on lightening up her loaf. The dough was dense and didn't seem to get baked all the way through when following my recipe for No-Knead Einkorn Sourdough Bread. Read, listen, or watch below! Q: Does Sourdough Bread Get Moldy? Thank you for your past help. I tried to make the loaf pan and roll sourdough bread per the recipe (No-Knead Einkorn Sourdough Bread). It didn't go really well. The dough didn't rise and then the bread was very dense, no air pockets even though cooked the correct time. What went wrong? Do you have suggestions? Also, after three days it molded. See attached picture (above). Is that normal for it to mold that fast? I want to try again but would love some guidance as to what to do differently. Thank you so much. I'm happy to help, Julie! Are the dark spots what you're thinking is mold? If so, I don't think that's mold — that's where the baking soda didn't get mixed in well enough. Your bread does look underdone, which can happen with a denser dough that you've mentioned. A longer bake would help. So would improving the texture of the dough so it's not so heavy. I give many tips on lighter, less dense bread in this Ask Wardee #053: Less Dense Sourdough Bread. In #AskWardee 018, I shared my own daily sourdough routine, which involves what I call “daily maintenance amounts”. Go here to get all my best feeding tips. Even though I talk about using small amounts of flour for feeding (in episode #18), keep in mind that you should also make sure the starter is getting enough food to support the work of rising bread dough. It's different for everyone. Your clue to whether your starter is strong enough is the daily activity it shows — bubbles, yeasty/fresh smell, etc. If your starter doesn't rise the bread and isn't as active, it might need to be fed more at each feeding or might need more frequent daily feedings, like three instead of two. Go with small-enough amounts of flour so you don't overwhelm your life and to be frugal with flour, but not with amounts so small that the starter suffers and doesn't perform well. By the way, here are instructions for creating an einkorn sourdough starter. Taking the day or two leading up to baking and give the starter plenty of food and TLC so it's really strong and active. This also ensures it has plenty of acid to react with the baking soda to add extra lift. Sift your flour before making the dough (if not using fresh-milled flour). Rising your dough at a warm room temperature. Those brown spots in your bread are signs the baking soda wasn't worked in well enough — so do a few more folds to ensure it is mixed throughout. Bake longer if the dough is dense, so it cooks all the way through. You can cover the top with parchment paper near the end so it doesn't get too brown. 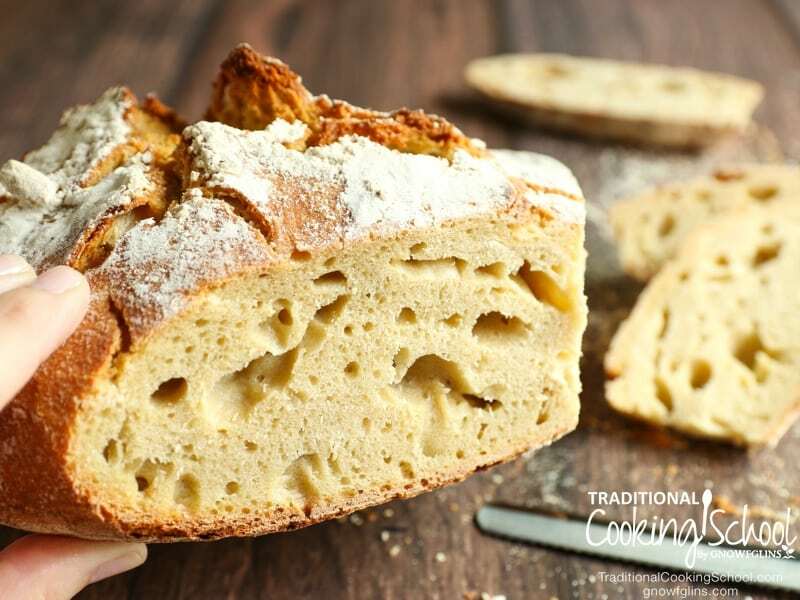 Even though sourdough bread's natural composition resists mold, due to the vinegar produced by the sourdough starter's organisms, it does still mold eventually. How long depends on the doneness of the dough, how it's stored, and the humidity/temperature conditions. Certainly, if it's not baked all the way through, it can mold in three days … or less! If it's humid or warm, any bread will mold in three days or less. I don't like to keep our bread at room temperature as long as three days because homemade bread dries out faster. I pre-slice it and keep in the freezer and take out just what's needed for that day, or even on the spot to put in the toaster because it's pre-sliced. Then you have fresh bread on any day. Mockmill home stone grain mill — Limited time: get 2 free eBook packages from me with your purchase! #AskWardee 018: What's Your Daily Sourdough Routine? How long does your sourdough bread last? 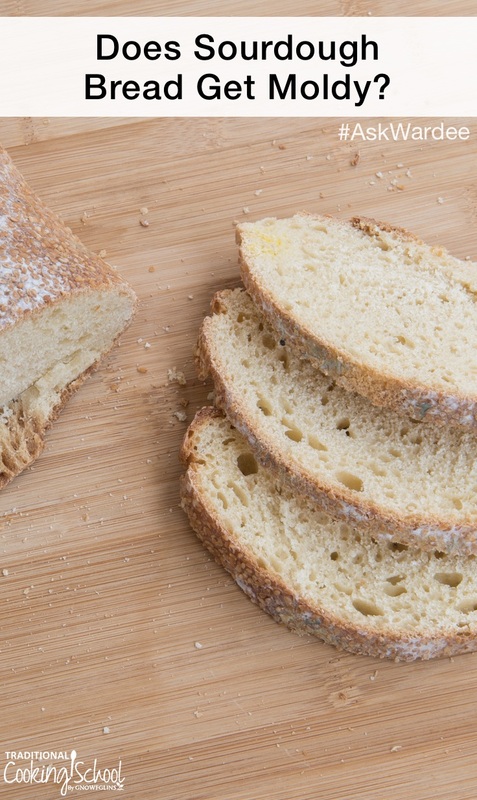 How do you ensure a light, well-baked loaf? I normally make the no-knead Einkorn sourdough bread in my Dutch oven which makes one loaf so when you use a loaf pan, does it make one or two loaves? What type and size of a loaf pan do you use, (glass, tin, ceramic etc)? When baking the bread in a loaf pan, do you need to cover the bread as it bakes? Jeanette, I generally use a loaf pan when I make bread (I don’t have a Dutch oven). I usually fluctuate between a big, what I call industrial size loaf pan, and a “normal” size (of which I use two when making this recipe. Mine are metal, but I have some smaller ones that are a type of glass. I generally do not cover the bread. I might bake longer and cover it for the final, say, twenty minutes at a lower temperature since my most recent loaf came out underdone. Wardee, can you please give us the inch size of your loaf pans? My pans tend to not be exactly straight sided. I suppose you get two loaves in the loaf pan with the No Knead Einkorn recipe. Here are the loaf pans Wardee ues: http://amzn.to/2CMp454 They are 8.3 x 5 x 4 inches. She doesn’t quite get 2 loaves so that’s why she increases the recipe 250% to get 3 loaves at a time. I measure the temperature of my loaves that are very large in the dutch oven with an instant read thermometer to 200 degrees. “Mom, this is the best bread EVER!” …and just 15 minutes of hands-on time!